Are you a volunteer managing a time-consuming town hall booking system? Are you a Parish Clerk with an unreliable parish hall booking system? Would you like a community hall booking system? Or does your school need an assembly hall booking system? If the answer is yes, then Hallmaster International have a hall and venue booking solution to support your organisation. With a busy town hall, a slick town hall booking system is the most efficient way of managing your town’s busy event calendar. 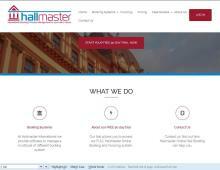 The town hall reservation system from Hallmaster International allows you to manage multiple rooms and allows users to create an account where they can view their invoices and bookings. The Hallmaster system is also a suitable as a parish hall booking system. The community hall booking system from Hallmaster International is a real time community hall reservation system that allows the local community to view events on the calendar and find out more information. The community centre booking system can be embedded into a community website to reduce the direct contact needed to a bookings clerk. Using an assembly hall booking system couldn’t be easier! Hallmaster has the capability to manage bookings for multiple halls and classrooms using their online assembly hall reservation system. The online system is simple to use and can help your school, college or university manage both frequent and one-off bookings. If you are looking for a community centre reservation system or a parish hall reservation system, contact Hallmaster International for more information on their venue booking and invoice management system.